When the weather starts to get really hot and humid I cannot face a stove and look for lunch meals that are uncooked. Salade Nicoise is one of my all-time favorite lunch time salads. It is substantial, contains carbohydrates, protein, and roughage while tasting absolutely delicious. 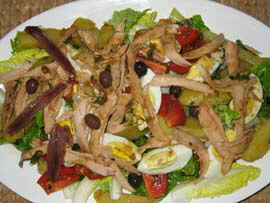 Until recently, making a proper Salade Nicoise in Manila was a difficult taskâ€¦ local tuna was mushy and fishy, romaine lettuce hard to find, nicoise olives impossible, and green beans were large and tough. Recent improvements in romaine availability, the appearance of proper haricots verts (tiny French green beans) and a near brilliant find of locally canned premium tuna has made this salad much easier to assemble. To make the best possible Salade Nicoise I like to start with a bed of small romaine lettuce hearts, add chopped boiled potatoes, blanched and cooled haricots verts, vine-ripened tomatoes sliced in wedges, wedges of cooled boiled hens eggs, canned tuna (here my secret find of prime tuna, with prime meat that has enormous flakes, more in a later post), nicoise olives (small black olives with tender skins and meats which I still have to buy on foreign trips and stock in my pantry), salt packed anchovies and a balsamic or red wine vinaigrette. Season generously with salt and pepper. Everything but the olives are available locally. If you want maximum flavor punch for the bland local potatoes, dress them with vinaigrette when they are still hot, but wait until they cool a little before adding to the rest of the salad. Serve with some French bread and have a great lunch!